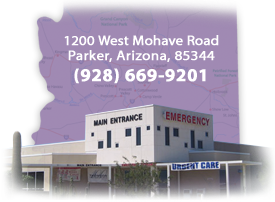 Tri-Valley Medical Clinic is a Family Health Care Clinic located in Salome Arizona and operated by La Paz Regional Hospital.The hospital leased the clinic from the Tri Valley Medical Association to provide local medical care. The year 2012 served as the 10th anniversary of the clinic's operation under the hospital. The clinic offers services to children and adults. It is a member of the Vaccines for Children program and participates in the Tobacco and Chronic Disease Management program. The clinic accepts most insurances, including Medicare, Medicaid/AHCCCS, and Blue Cross. As the only clinic in the area, our mission is to provide consistent, high quality medical care. We hire dedicated doctors and practitioners, who understand our needs and the needs of their patients. We want to be a part of the community we serve. Continue on AZ72 past Bouse.